POWER REQUIRED 6-8 CFM at 90 PSI. Tiles(vinyl, ceramic, quarry...), Carpeting, Roofing Materials, Fireproofing, Rubber coatings, Waterproofing, Linoleum, Insulation, Asbestos, Mastics, Paint build-up, Ice. Ergonomic design lets operator stand upright eliminating backaches. Provides 2,500 hits per minute. 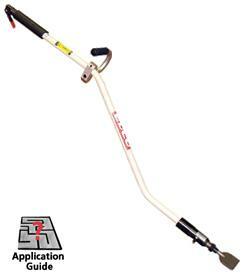 * Please call us with any questions you may have about our scaler air powered long reach w/4 inch bit in Kingsport TN, Johnson City, Elizabethton, Rogersville TN, Gate City VA and the NE Tennessee, SE Kentucky and SW Virginia Tri-State Area.